I respect Harari's work a lot. He's triggering conversations we should all be having. To me, it felt like these 21 lessons were more insights than actual, actionable lessons. Some chapters showed more direction than others though, which is what I was expecting to find coming into this book. The chapter on terrorism, for instance, really struck a chord with me. Overall, Harari strongly and rightly criticises our current "story" (liberalism/humanism), yet doesn't quite offer a cohesive, compelling alternative. Maybe he wants us to make our own decisions as to where to go next? I'm not sure. Most of the insights in there could have been extracted from Harari's two previous books with relative ease. It doesn't mean there isn't value in rehashing and reformatting them, just that novelty isn't fully on the menu. 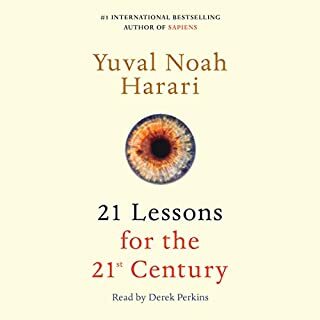 If you're not familiar with Harari's work, I think you'll enjoy this book even more. It's a solid entry point into his meta, long-term view of the human race.